Home / Columnists/ Towards exports of $ 50 b; doable or what? Towards exports of $ 50 b; doable or what? 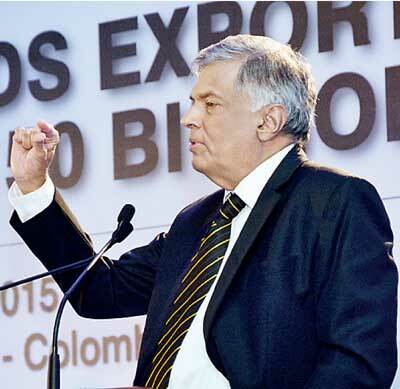 The Prime Minister addressing the Sri Lanka Economic Summit organised by the Ceylon Chamber under the theme ‘Towards Exports of $ 50 Billion’ said the $ 50 billion is an achievable target, provided there is a systematic approach to export development. Sri Lanka as a small developing country currently exports around $ 11 billion, therefore to get to $ 50 billion the country would from now on need to add on new industries and products, as the existing industries would not get us there in the near future. Today, our trade deficit continues to widen. For example it has widened by 10% to $ 3.4 b in the first five months of the year. Despite the significant improvement recorded in exports of textile and garments, lower performance in tea, seafood and gem, diamond and jewellery exports contributed to this decline. Tea exports, which were severely affected by the lower demand from Russia and the Middle East, declined for the eight consecutive months in May 2015, recording a drop of 12.1% compared to the corresponding month of 2014. Seafood exports, which dropped continuously from October 2014, recorded a further decline of 39.3% by May 2015, compared to the corresponding month in 2014. This reduction was mainly due to the current EU ban. Therefore, if are to get to $ 50 billion at least by 2025, the country needs new ideas, new products, new industries, new services, new regulation, new skills and competencies and new financing instruments - a hybrid of traditional instruments and new instruments. Often great product ideas come from SMEs. Therefore there is a need to build capacity within the SMEs. Supporting the SME sector is therefore very important. Funding is of course the biggest issue that the SME sector faces, as borrowing costs in Sri Lanka can be quite high. Availability of Venture Capital (VC) and other financial services is another big challenge for SMEs. Provide soft loan facilities for export related investment and for working capital needs. Strengthen the Export Credit Insurance support. Provide export financing on the basis of feasibility of the project rather than collateral alone. Factoring export receivables, banks could provide cash to exporters, which would help exporters to meet cash requirement before the actual payment is received. Set up an EXIM Bank – Study the current financing gaps and set up an EXIM Bank to fill these gaps especially to capture new markets and venture into exports of new products. Get banks to move into global banking networks and set up new faster secure payment systems. Provide incentives to sell via secure web-based systems. Flexible credit tenors based on markets while ensuring the exporters bring back the export proceeds. Amend the Exchange Control regime to set up subsidiaries and offices overseas to promote exports. Finally, get banks to be more transparent on the fee structure, including overseas charges. In the final analysis, if we are to get to $ 50 billion, the financial institutions would have a key role to play. Lankan banks would therefore have to up their capability internally to support the industries of the future. Furthermore, banks would need to provide export financing on the basis of feasibility of the project rather than collateral alone, if the emerging new industries are to set up and grow. The role of SLECIC and EDB would also need to be critically re-examined in consultation with the private sector.